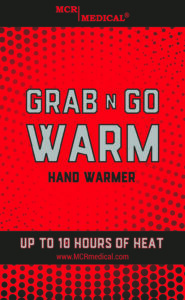 Grab-N-Go Warm Hand Warmers 'Shake Up' the Industry! MCR Medical Blog » Grab-N-Go Warm Hand Warmers ‘Shake Up’ the Industry! After months of product development we believe that our new hand warmers are superior to any on the market. With the addition of our free shipping and low pricing you will not find a better deal online. We of course encourage you to shop around but we are confident you will come back to MCR Medical for the Grab-N-Go Warm hand warmers. With our Grab-N-Go Warm hand warmers, we are offering “try them before you buy them” for all of our customers. This is because of our commitment to excellent customer service and gives you a chance to try out our Grab-N-Go Warm hand warmers for free. Just email us your shipping address and enter ‘free hand warmer sample’ in the subject line. Soon your free sample will be on it’s way! We are extremely excited that these have arrived just in time for the winter months. Several have already been sold and utilized with many deciding to buy in bulk because of the our incredibly low pricing. Customers have ordered them not only for themselves but for others who work out in the elements or enjoy outdoor sports and are genuinely impressed with the quality. Whether working or playing these are a great item to have in extremely cold temperatures. Keep a few pairs in your emergency car kit and your bag to have just in case. And always play it safe in bad weather. 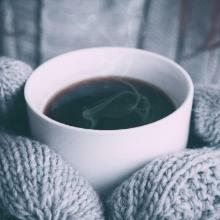 Check out some of the alternative uses for hand warmers below. Try placing them on the side of a water bottle to keep the water from freezing. Or try placing snow in a water bottle and melt it using the hand warmer to make it drinkable in the case of an emergency. Camping in cooler weather can bring many challenges. 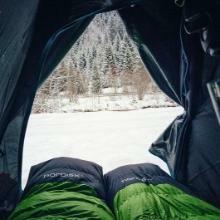 The hand warmers can be placed inside your sleeping bag to help keep you warm through those chilly nights. 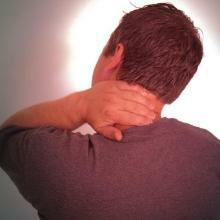 Have you been experiencing aching or sore muscles? Try placing one of our hand warmers on the area of discomfort. The heat will relax the muscles while increasing blood flow and circulation. Please visit our website for more information on our hand warmers and all of our emergency supplies. You can also call us at 614-782-2100 and we will be happy to answer any questions you may have. These ARE great for the cold days. Would you like me to send you a free sample? If so, please email sales@mcrmedical.com with your shipping address. Please put ‘free hand warmer sample’ in the subject line. Please email me at sales@mcrmedical.com with your address and I will ship out your sample out to you. These sound like they should keep you warm this winter. Pingback: Who doesn't Love a Deal! Stock up now on Grab-N-Go Hand Warmers. My daugjter works on a thoroughbred horse farm. I know she can get pretty cold. I thought this might be a really good Christmas present. A bulk supply, if the sample is suitable inside her work gloves. Churches in our area sponsor a “Blessing Box” where anyone can put in items useful to the homeless and food insecure and anyone can take what they need. Hand warmers are ESSENTIAL in winter and yours are the most reasonably priced I’ve seen. Ordering today! Previous Previous post: Black Friday CPR-First Aid Training Supplies Deals Drop at 5PM EST Today!